Last Tuesday evening it was time once again to welcome some of Sydney’s well known food bloggers to our Garfish Manly restaurant, as well as some local media. 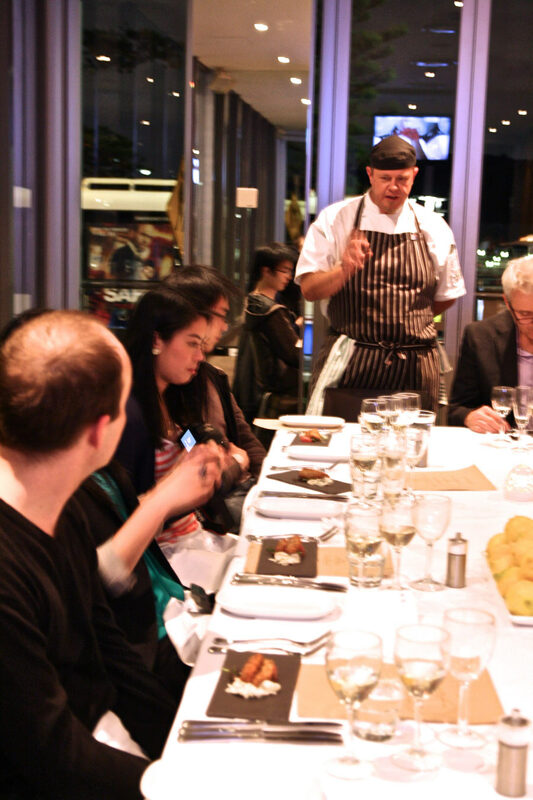 It’s an event we hold once a year with the aim of providing bloggers and media an opportunity to sample a carefully chosen selection of Garfish cuisine. We’ve earned a reputation as Australia’s Best Seafood Restaurant based on customer reviews, but we’re always keen to see what self-confessed foodies think of our offerings. Garfish Executive Chef, Stewart Wallace, hosted the night and created a special menu for the event. On arrival, our guests were greeted with canapés of prosciutto, white anchovy, basil, bocconcini and semi dried tomatoes. Following this, a shellfish bisque with gruyere was sampled and then a third course of parmesan crumbed sardines with fennel remoulade. John Reid, from Reidistribute, was our guest speaker of the night. Reidistribute is a supplier to some of Sydney’s most well-known restaurants and as well as providing them with many of the essentials it takes to run a first class kitchen, they also source and supply some of the more unique goods like cheeses. John has an impressive background in both the hospitality and cheese industries, and was able to provide us with an insightful and entertaining look at the industry and how it has evolved over the years. He took the guests through a selection of cheeses accompanied by carefully selected wines. The first cheese, an Italian Tallegio, proved surprising. First it was sampled with sake and then a French wine – it revealed itself as a chameleon, changing its flavour depending on the wine! Other cheeses sampled included a Clarines from France, a flavoursome goats cheese, called Chabicou, from Western Australia, as well as a subtle blue cheese called Shadows of Blue from Victoria. We look forward to hearing the reviews on the Garfish cuisine as they hit the bloggers websites in the following days. Also look out for a review in the Manly Daily this Friday the 22nd June.